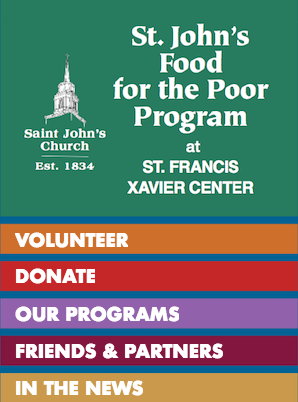 When you donate your tax-deductible gift of $1,000 or more to St. John’s Food for the Poor Program, your name (or your honoree’s name if applicable) will be recognized with an engraved plaque displayed on our donor wall in the St. Francis Xavier Center. A naming gift leaves a permanent legacy of your esteem for a loved one, a family, a business or organization. to mark a special occasion, to pay tribute to a respected friend or colleague, or to show appreciation to an organization. Plus, your act of kindness and thoughtfulness benefits Worcester’s needy and hungry who rely on St. John’s Food for the Poor Program. Many companies offer Matching Gift programs to encourage employees to contribute to nonprofit charitable causes. Some companies even provide matching funds to support employee volunteer hours. Check with your company’s human resources and benefits department for instructions. You can help St. John’s Food for the Program by placing one of our donation boxes at your place of business! Our small acrylic box sits quietly and neatly on a counter or in a reception area where customers and visitors pass by. Retail businesses can place boxes at checkout counters; companies and institutions can place a box in any high-traffic area where it can be supervised. St. John’s Food for the Program gets a small but steady income, and, community awareness. We monitor the box and refresh the signage seasonally. You demonstrate your awareness of problem of hunger in the Worcester area; you show your support of St. John’s Food for the Program; and you get our heartfelt gratitude. To receive your Donation Box contact info@stjohnsfoodforthepoor.org.